The Royal Canadian Mint just released their figures for the quarter showing record Silver Maples sales for the year. Sales of Silver Maples weren’t as strong in the third-quarter compared to the same period last year, but they outperformed Silver Eagles in percentage terms. Most of the weakness in sales of these official coins took place in July and August. However, Silver Eagle sales picked up significantly in September reaching 4,140,000 surpassing last year’s monthly figure of 3,013,000. 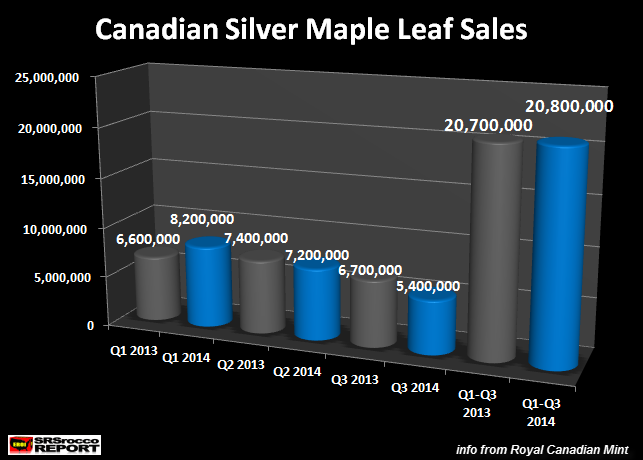 The Royal Canadian Mint does not break down its sales figures on a monthly basis (quarterly reports), but I would imagine Silver Maple Leaf sales picked up substantially in September paralleling the huge demand for Silver Eagles. When I first opened the Royal Canadian Mint Q3 2014 Report, I thought sales would be higher… however, I forgot to consider the large drop in demand during July and August. I believe the fourth quarter sales figures will come in substantially higher pushing Silver Maple Leaf demand to a new all-time record. Looking at the chart above, Silver Maple sales were very strong during the first quarter at 8.2 million oz — largest quarterly record ever. Then in the second quarter, sales declined slightly to 7.2 million oz, compared to 7.4 during the same period last year. However, the 1.3 million oz decline of Silver Maple sales in Q3 2014 compared to Q3 2013 was the reason overall sales figure year-to-date wasn’t much higher than last year. But, sales of Silver Eagles increased substantially during the last paper take-down reaching a monthly record for October at 5,790,000. The U.S. Mint had to suspend sales on November 5th due to its inventory being totally wiped out. The Royal Canadian Mint also put the sales of its Silver Maples on limited basis due to high demand as well. If the U.S. Mint provides another update for the last few days in November and sells at least the same number of Silver Eagles in December (1,200,000) as it did last year, we could see nearly 43 million sold for 2014… another record year. I also believe demand for Silver Maples will increase substantially in the last quarter of 2014 also leading to a new record year. Prior to the U.S. Investment Banking and Housing Market collapse, the total sales of Silver Eagles & Maples were only 13,870,000 in 2007. Hell, Silver Maple Leaf sales were only a paltry 3.5 million compared to the estimated 28.5 million this year. In just seven years, sales of these two top official coins are 5 TIMES LARGER at an estimated 71.5 million. THIS IS A BIG FIGURE and now represents nearly 9% of global silver mine supply in 2014, compared to 2% in 2007. Basically, total Silver Eagle and Maple Leaf sales in 2007 represented 2% of global mine production and now almost consume 10%. However, this only includes demand from a very small portion of the investing public. 95% of the public invested in the markets have their wealth tied into the biggest Paper Ponzi Scheme in history. Right now, Silver Eagles and Maples are totally unknown by the majority of public, but I would imagine this will change in the future as the COLLAPSE OF ASSUMED PAPER WEALTH takes place in earnest. If the Royal Canadian & U.S. Mint have difficulty now trying to meet demand for the 2-5% of public demand… what happens when the GREAT RUSH INTO GOLD & SILVER BEGINS? ?